Today's review looks at one of the most popular Euros of the last few years: Keyflower. The Key series of games are all designed by Richard Breese, and feature varying mechanisms and themes. They also vary in quality. Is Keyflower Key-riffic? Let's find out. At the base level, Keyflower is a mash-up of mechanisms: auctions, bluffing, worker-placement, tile placement, set collection, memory, route-building, delivery. It sounds absolutely insane. How could that possibly work? 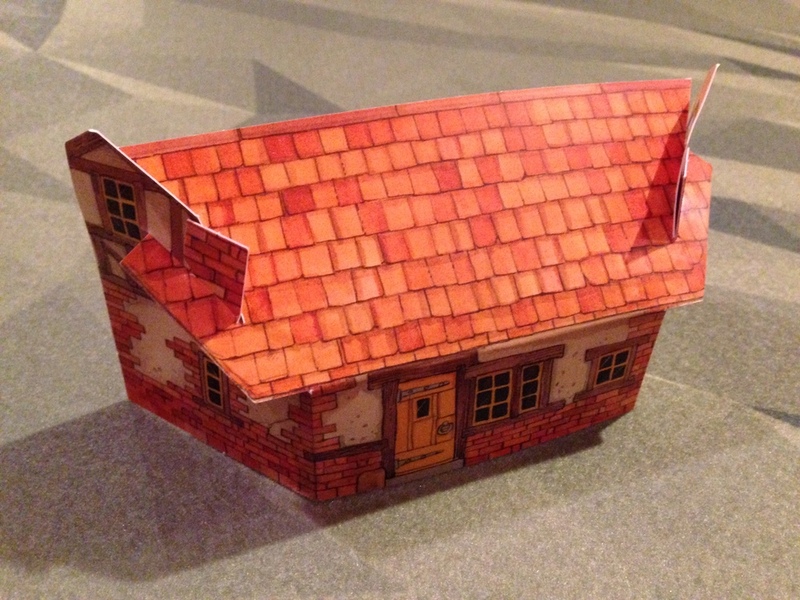 In Keyflower there's some important hidden information, so the game comes with cute houses as player shields. The number and color of meeples each player has is a "key" to this game, so it has to stay hidden. At the beginning of the game each player randomly draws eight workers from the bag--these will be either blue, red, or yellow--and puts them into the house. each house in the game is completely unique. Then you'll lay out a number of Spring tiles (depending on the number of players), and return the rest to the box. There are also Boat tiles (ALSO depending on the number of players) that you'll fill with randomly drawn meeples from the bag. Players will always know what number and color of workers are coming for the next round, so they can plan accordingly. You're ready to play. Jeremiah--There's a lot of up-front housekeeping in the setup, but once it's done things move along pretty smoothly. And once you get into the first round you know exactly why everything is secret and randomly drawn. The setup is my least favorite part about this one, but it is SO worth it. Firestone--Yeah, both setup and explanation for Keyflower are on the heavy end. But it's fully a gamer's game, so those folks are used to it. The game is played over four seasons, starting with Spring and going through Winter. Each season a random set of tiles will be available for players to bid on and use. Each of these tiles has a different ability. For instance, the Gold Mine generates a gold when you activate it. A Workshop lets you pick one of three resources when you activate it. The Mason lets you turn a pickaxe Skill tile into three stone. There are lots and lots of different tiles like these. And the abilities get more intricate and efficient as the later-season tiles come out. AND, you can upgrade tiles so they do even cooler things. If you upgrade that Gold Mine, you get two gold. An upgraded Workshop lets you get all three of those resources instead of just one of the three. Jeremiah--The tiles do really cool things. I don't think there's one in the game that isn't worth going after. The strategy turns toward really narrowing in on the tiles you want/need. It's easy to get too many tiles and never really benefit from them/upgrade them--it's a pricey process! But how do you get those tiles? As I said, in each season a number of that season's tiles are set out. Everyone will take turns either bidding on tiles, or taking the action on a tile. This is where it gets tricky. Bidding--If you bid on a tile, you take any number of workers of a single color from behind your screen and place it on the tile you're bidding on, on the hex-side that faces where you're sitting. If someone already has a bid on a tile, you must use workers of that color when you increase the bid. If you're the first one there, you're setting the color that every player must use. If you're overbid, you can then increase your bid by adding more workers of the same color when it gets back around to you. Or you can move any workers that have been outbid to another tile, but they must go together--so if you have three workers who have been overbid, they have to go somewhere together and can't be split up. There are also Turn Order tiles players can bid on, which determine the order that people choose incoming boats, and set the start player for next turn. Production--You can also place workers on tiles--even tiles in the process of being bid on!--to activate the special abilities. This is also somewhat tricky. You have to follow the color rules already mentioned. If people are using yellow workers to bid on a tile, you have to place yellow workers to activate it. You can also set the color this way. More than one person can activate a tile for production, but just as with bidding you have to use more workers than the last person--up to a max of six workers on a tile. When you activate, you take the action immediately. Want more complexity? You can activate production tiles that are out on the table being bid on, in your own village that you've already won, or in someone else's village! Madness! The season is over when everyone passes--you can pass and get back in as long as everyone doesn't pass in succession. Any workers used unsuccessfully for bidding are returned to behind players' screens. Any tiles that weren't bid on are removed from the game, and any workers on top of them (that were used for Production) go back in the bag. Starting with the start player (to avoid confusion), each player takes tiles they've won--along with any workers on top of them, which are added to their screens. Workers used as a successful bid are returned to the bag. Any workers on tiles in your own village--whether you put them there or an opponent did--go behind your screen. Jeremiah--Agreed. It makes winning great tiles--or tiles you KNOW someone else is coveting--that much better. There's a good chance you'll be taking in some workers on it next season! 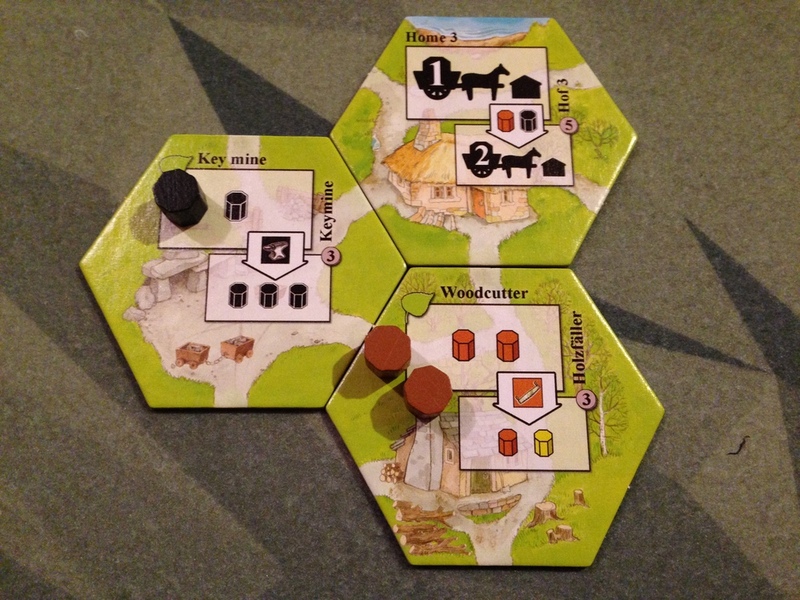 So you place won tiles into your village, and you have to connect roads to roads, and roads can't dead-end into a field, etc. These connections are all important because to trigger some actions, or upgrade most tiles, you have to have resources on them to do it. We won't go into the intricacies of that, but there's also a route-building and delivery aspect. In new player order, you'll pick a boat of new colonists, coming over from the Old World to become workers, and add them behind your player screen. Firestone--This is no small decision, because the ships give you varying numbers of colonists (and usually Skill tiles if there are fewer colonists), but because they're randomly drawn out when you populate the boats, you might want the ship with fewer colonists because it has lots of a certain color you're trying to collect. Or any one of 100 other reasons to pick one over another. Jeremiah--Yeah, there's been plenty of tension over when to place a bid for the player position of choice, and who's going to take which boat!! Talk about trying to wear a poker face! There are a few other details involving boats, starting tiles, and a few other things, but those are small and not necessary to the review. At the end you score VPs on tiles and various other means, and whoever has the most wins. Firestone--Keyflower isn't for the faint of heart. It's a meaty Euro with a lot going on and a lot to think about. But it's exactly the type of Euro I love. Jeremiah--Yeah this one hits on all cylinders, with classic-looking art/graphic-design it feels like a great old favorite. The gameplay is incredibly deep and EVERY decision carries great weight! Not to mention a 3- or 4-player game can be played in just about an hour. Firestone--I love the variety of tiles available in each season. Even if you never pick up any promo tiles, you'll still only use a subset of the available tiles every game, so each will be somewhat different. Firestone--Another plus is how well this scales. I would rather gouge my own eyes out with a spoon that play most games with six players. But this one scales remarkably well. I still think its sweet spot is probably 4(+/- 1), but both the high and low player counts work. Firestone's Final Verdict--I came into this review fully expecting to give Keyflower a strong and solid 9. But as I wrote the review, and thought about the game--and about the games of this I've played--I can't deny it: It's a 10. A rare game I think is just perfect. It mashes up half-a-dozen different mechanisms--any one of which is usually enough to provide a framework for a great game--but it melds them beautifully and thoughtfully into a game that's a joy to play. Jeremiah's Final Verdict--While it's a gamer's game through and through, which means I'll probably not get my wife to play it, ever, there aren't many games I would rather play than Keyflower. It incorporates nearly every gaming mechanism I love into one great gaming experience. I give it a 10. Have you played Keyflower yet? What are your thoughts? Sound off in the comments! Theology of Games would like to thank Game Salute for sending us review copies of Keyflower. This in no way affected our opinions of the game.